I am still trying to get a picture of a crow on the nest in this tree. Every day I pass by. Sometimes there's one sitting there but by the time I've stopped the car and persuaded the camera that it should be taking a shot the bird has flown or ducked down out of sight. I tried walking up one pleasant day recently and stood inconspicuously opposite. I waited for best part of an hour but, whilst almost every other bird in the area seemed to go home, no-one returned here. I have a feeling that they were watching me and probably returned just as soon as I wandered off with just a picture of the tree for my trouble. To make up for that, though, I did manage to get an unexpected photo this evening. Wandering around the paddock, I heard something similar the sort of noise a duck or coot might make and spotted at least one tiny little black fluffy thing on the edge of the water near some reeds. I dashed back to get my camera and sat waiting for him or her to take another trip. Eventually, heading for the warbling noise his mother (or father, I suppose,) one little fellow came into view briefly. I shall return and take a newspaper and drink next time as I'm sure that, if I wait, there'll either be more or a chance of a better shot. 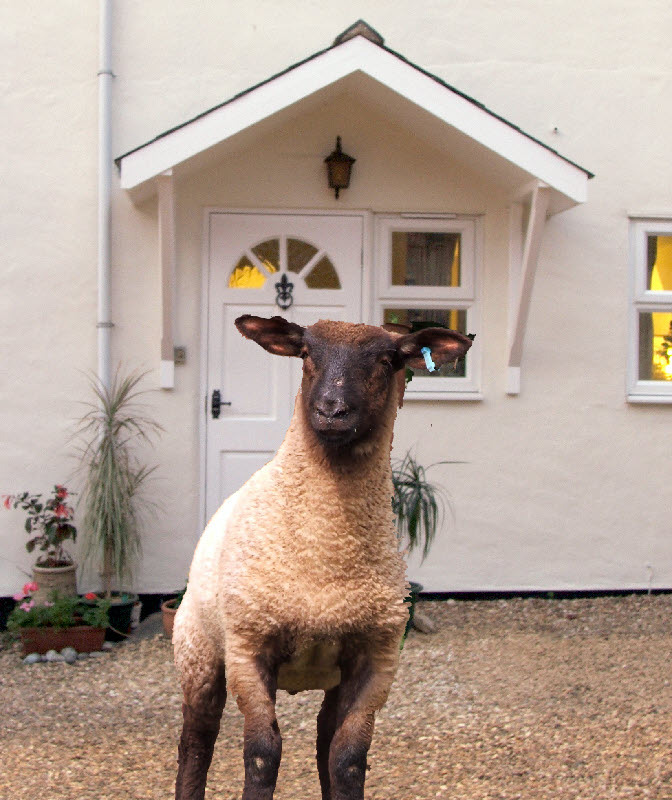 A large lamb just appeared at my front door. That made for an entertaining Bank Holiday late afternoon's exercise and 'planning'. I have no idea how she got out of the field but it certainly wasn't via the fence round the paddock that we spent a lot of time an effort fixing regularly when the lambs were younger. Rather than risk her belting off down the road, though, and frightening some poor old couple on an afternoon jaunt or eating more neighbours' daffodils than might be good for her, I decided that the best bet was to persuade her to go into the paddock where I could figure out what to do next. That bit was relatively easy, although I do wish I had closed the door to the geese's quarters first. However, once out of there it seemed a fairly simple task to get her to head for the place where there used to be a gap in the paddock fence. Armed with some tools, I reopened the place which I thought she might have remembered and hoped she might find it on her own, especially with all her family's bleating noises coming from vaguely that direction. No, she was far more determined to return whence she came. Must be a memory thing - short-term excellent but recalling escape routes from March lousy. I know how she feels. After several races back and forth she did finally get in the right direction and I was about the head her down the funnel towards the newly opened gap when the farmer arrives! One look at him and she shoots off again in completely the wrong direction and proceeds to chase the geese back into their quarters and then out again almost as it she was enjoying the game. Her mistake, though was to return once more to the empty geese quarters where the farmer was able to pick her up bodily and cart her back home. I swear she was smiling at me as she went off!